Pet costumes – Make sure pet costumes do not contain dyes or paints that are toxic if ingested. Costumes should fit the pet comfortably, allowing them to walk and lie down. Check around the neck and legs for elastic bands that may cut of circulation or make it difficult to breathe. Never use rubber bands! Also, make sure your pet can’t chew off and swallow their costume. Cats love to eat costume jewelry and ribbons while dogs favor the fake skeletons. Decorations – Halloween decorations can be scary as well as dangerous for pets. Fake skeletons may be too realistic for some dogs to resist. Many cats find the fake cobwebs enticing. Eating these items may obstruct the animal’s gastrointestinal system leading to expensive surgery to remove the decorations. Jack-o-lanterns – Keep all pets away from jack-o-lanterns. Pets, especially cats, are drawn to the flickering light inside. After Halloween, I see many pets with singed whiskers. The battery operated candles don’t cause fires but are highly toxic if ingested. I saw a lab who suffered greatly after eating a pumpkin with a battery operated light inside. Electric cords – Keep pets away from cords to prevent electrocution. 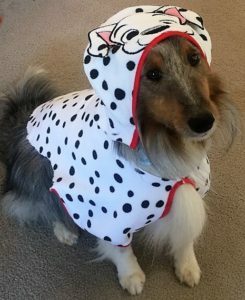 Accidental escape – The loud noises, scary costumes and open doors for trick-or-treaters lead to many lost pets during Halloween. I recommend letting your pet sit this holiday out with some treats in the back bedroom away from all the action. Play music to distract from unusual noises. Bring all animals indoors. Even when pets are in secure outdoor enclosures, there is a greater risk of theft with all the people coming and going. Please take extra care with black dogs and cats. Over my career, I have seen horrible animal abuse associated with this holiday – particularly with animals whose fur is black. Candy – Candy possesses a variety of dangers for pets. First, there is the danger of chocolate toxicity from having too many fun bars. Second, foil wrappers and lollipop sticks may causes intestinal obstruction. Third, many candies contain the artificial sweetener xylitol that causes life-threatening drops in blood sugar. One stick of sugar-free gum can kill. With a little planning, Halloween can be fun for the entire family. Please follow these tips to make sure everyone has a good time. Happy Halloween! Shaw, Kathleen. ‘Halloween can be Spooky for Pets’, Veterinary Partners, VIN.com, 2013.